Despite the pending lawsuit against Fisker Coachbuild, Car and Driver reports that the Karma is undergoing testing and the California based plug-in hybrid can now be ordered. The lawsuit filed in mid April by Tesla alleges that Henrik Fisker fraudulently agreed to take on the $875,000 design contract for Tesla's electric powered sedan (the White Star) to gain confidential design information and trade secrets to build their own EV sedan. 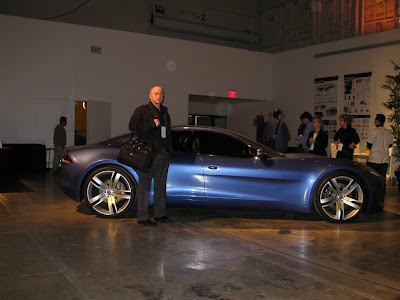 Henrik Fisker had remained silent until recently, when he fired back by saying the the lawsuit was "nonsense". 1. This is a new era for the hybrid/EV market. The technology is emerging as such a powerful alternative to fossil fuels that there's a strong enough market opportunity to cause people to sue eachother, battling to have the upper hand and lead the revolution on the competition. 2. Having seen the Karma in person, you can clearly see Fisker's ties to BMW and to Aston Martin (he designed the BMW Z8 and the Aston V8 Vantage) since certain aspects like the front fascia and rear badging are very much Z8 and the lines are similar to the Aston. These are two VERY popular designs, so it's no wonder that Fisker took certain cues from each vehicle to build his own. It also makes sense from having seen the result that if Tesla feels as though what they got from Fisker (intentionally sub-standard or not) will not be able to compete with the Karma, that they undergo a redesign. 3. I had the opportunity to meet Henrik Fisker and to discuss the Karma, sustainability and EV solutions in general over lunch in February and he seemed true to his word. He said at the time that he was booked with orders through mid 2010 and planned to produce 15,000 vehicles per year (very interested to see how he will accomplish that), so in the current Car and Driver article I've cited that states 500 orders and a rate of 1,250 cars per month, his claims hold true. Also, I'd like to think I'm a good judge of character and in the few hours that I spoke with him, this type of behavior didn't seem to be in his character. Not to say that Tesla's claims are totally unfounded, because I don't have all of the details and I'm sure they wouldn't stick their neck out if they didn't feel they're claims were somewhat justified, but from his record, the level of intelligence he seemed to exert as I spoke with him, and the fact that I'm sure he was well aware all eyes were on him during his time at Tesla and certainly even more so when he introduced his own design shortly after, he would not intentionally try to hoodwink Tesla by performing sub-standard work and then design his own car. His name is attached to both cars - in the design of the Tesla White Star, and LITERALLY on the Karma! Why would he intentionally tarnish his good reputation just as he was undergoing a movement to lift it up even further by starting his own car company? In any event, the key here is point #1 - this is proof positive that things in the hybrid/EV market are heating up! We'll be sure to follow this case and many others as we make the move to go local and to go green.